What is Militia of the Immaculata? 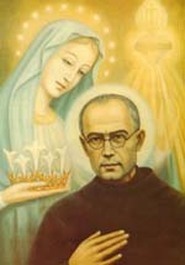 The Militia of the Immaculata (MI) is a worldwide evangelization movement founded by St. Maximilian Kolbe in 1917 that encourages total consecration to the Blessed Virgin Mary as a means of spiritual renewal for individuals and society. The MI movement is open to all Catholics. It employs prayer as the main weapon in the spiritual battle with evil. MIs also immerse themselves in apostolic initiatives throughout society, either individually or in groups, to deepen the knowledge of the Gospel and our Catholic Faith in themselves and in others. Marian consecration is a formal act of self-giving that does not stop at Mary, but is Christ-directed. It is really consecration to Jesus. The MI's mission is "To Lead Every Individual With Mary to the Most Sacred Heart of Jesus." Visit the Marytown website for information about the National Organization that supports the works of the Militia... includes resources, "messenger" and Kolbe biography. Purpose of the local MI Family Village: To evangelize God’s people and bring them “To Jesus through Mary” using the teachings of St. Maximilian Kolbe and following his example of spirituality of Marian consecration for living Christ’s Gospel and spreading it to others. This group is for families with children and anyone else who enjoys being with families. The MI – Family Village meets on the second Sunday of the month after 9:00am Mass. The MI at St. Joseph's Church also has a "Prayer Village" which meets on the First Saturday of the month after the 8:00am Mass.